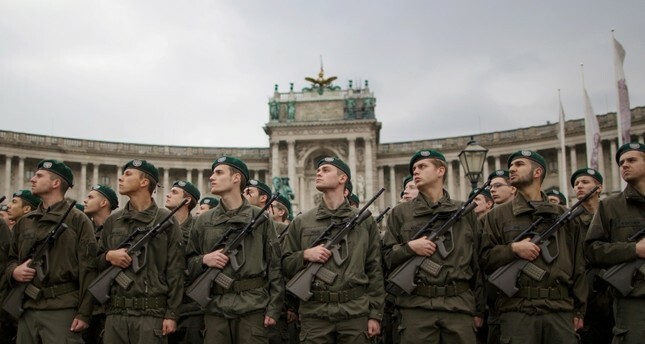 This Oct. 26, 2016 file photo shows recruits of the Austrian armed forces attending the swearing-in ceremony on Austrian National Day (Nationalfeiertag) on Heldenplatz square in Vienna, Austria (EPA Photo). Austrian Foreign Minister Karin Kneissl on Saturday called her Russian counterpart Sergei Lavrov to discuss the arrest of a former Austria colonel on charges of spying for Moscow. According to a statement by the Russian Foreign Ministry, Kneissl explained the motives of her government behind the arrest of the suspect. Lavrov reiterated Moscow's displeasure that Austria chose to air its grievances in public. He said the practice of voicing "unfounded accusations" publicly was unacceptable, the foreign ministry said. In August, Kneissl sparked a row in Austria and beyond after she waltzed with Russian President Vladimir Putin and bowed to him at her wedding, with critics saying her behavior hurt the country's image. On Friday, Austrian authorities announced the arrest of a former military intelligence colonel who allegedly transferred to Russia information on migration crisis, Austrian military aviation and artillery systems.